Due to modern advancements, Korda have recently been able to release a range of coated braids which have tiny tungsten granules impregnated within the coating, meaning that it will now sink quickly and lie tight to the lake bed. It has a semi-stiff nature, from the spool, so steaming it will probably gain you the best results once you have constructed your rig of choice. The coating itself has a nice, matte finish and remains easy to strip, whilst maintaining good abrasion resistance. It is available in either 18lb or 25lb breaking strains and in their two most popular colourways – Weedy Green and Gravel Brown. 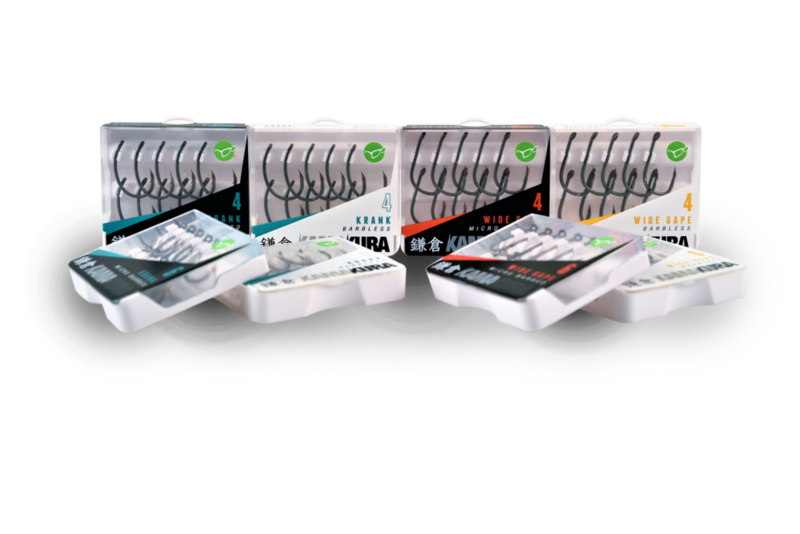 Billed as the sharpest hooks commercially available, the Kamakura range have been some three years in the making! Following on from footage revealed by their Underwater series of films, the chaps at Korda became convinced that an ultra-sharp hookpoint ultimately led to more pickups being converted into genuine takes and consequently, landed fish. There have been a number of advances in hook-making technology in recent years but this process of bestowing each hook with a Kamakura point, post production, is a genuine leap forward. Every hook in the packet has been honed to the same level of sharpness to ensure each and every one is exactly the same. Prior to being packed into the hard, protective case, each hook also has a blob of wax applied to each uncoated tip, helping to protect it, right up until you are ready to cast out into the lake. Currently available as size 4, 6 and 8, in both micro-barbed or barbless, in the standard gauge Wide Gape and Krank patterns, expect more to follow in the future.